Can be life-threatening. Often prolong hospital stay, and can be complicated by metastatic lesions and bacterial endocarditis. A 53-year-old white woman was admitted to the hospital with complaints of severe shaking during infusion of her hyperalimentation solution. She had been receiving intravenous hyperalimentation for 16years for a severe dumping syndrome that prevented eating by mouth. She had had multiple complications from her intravenous lines, including venous occlusions and line-associated bacteremia, requiring 24 line replacements. She had last been admitted 6 months earlier with Enter-obacter cloacae infection of her intravascular catheter requiring line removal andintravenous cefepime. Atthat time, a tunneled catheter had been placed in her leftsub-clavian vein, and she had been doing well until the evening before admission. As she was infusing her solution, she developed rigors, and her temperature rose to 39.2°C. She continued to experience chills and developed a headache. On physical examination, her temperature was found to be 38°C and her blood pressure, 136/50 mm Hg. She was nontoxic appearing. A ll/VI systolic ejection murmur was noted along the left sternal border (present for years). The site of the catheter was not erythematous or tender. Two blood cultures were positive for Escherichia coli. The sample from the catheter became culture-positive 6 hours after being drawn, and a simultaneous peripheral blood sample became culture-positive 5 hours after that (II hours after being drawn). Penicillin-allergic Clindamycin OR Cefazolin 600 mg IV 30 minutes pre-procedure 1 g IM or IV 30 minutes pre-procedure Cephalosporins should not be given to a patient with a history of an immediate hypersen sitivity reaction to penicillin. More than 200,000 nosocomial bloodstream infections occur annually in the United States. A large proportion of these infections are related to intravascular devices. 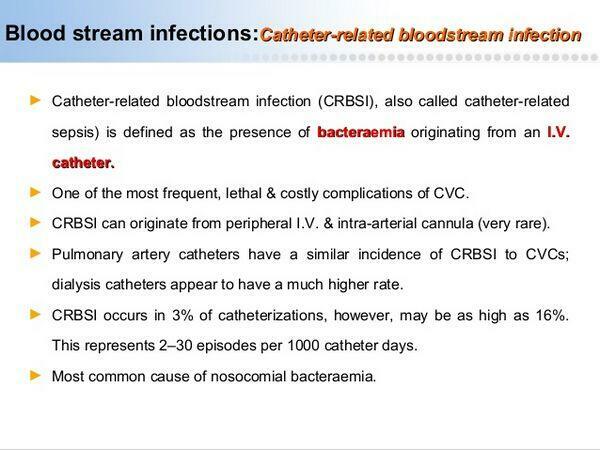 Bacteria most commonly infect catheters by tracking subcutaneously along outside of the catheter into the fibrin sheath that surrounds the intravascular segment of the catheter. Bacteria can also be inadvertendy introduced into the hub and lumen of the catheter from the skin of a caregiver or as a consequence of a contaminated infusate. Less commonly catheters can be infected by hematogenous spread caused by a primary infection at another site. Regular exchange of central venous catheters over guidewires does not reduce the incidence of infection. In fact, reinsertion of a catheter through an infected soft-tissue site can precipitate bacteremia. The organisms most commonly associated with intravascular device infection are skin flora. Gram-positive cocci predominate, with coagulase-negative staphylococci being most common, followed by S. aureus. Coagulase-negative staphylococci produce a glycocalyx that enhances its adherence to synthetic materials such as catheter tips. Catheter location and type affect the risk of infection. Regular exchange of central venous catheters over guidewires does not reduce the incidence of infection; the technique is not recommended, because it can precipitate bacteremia. Enterobacterspecies,Escherichia coli,Acineto-bacter species, Pseudomonas species, and Serratia species. Klebsiella species, Citrobacter, or non-aeruginosa strains of Pseudomonas are associated with contaminated infusate. Candida albicans also forms an adherent glycocalyx; associated with high glucose solutions. Enterococci and corynebacteria are other common gram-positive pathogens. Gram-negative bacilli account for up to one third of infections, with Klebsiella pneumoniae, Enterobacter species, E. coli, Pseudomonas species, Acinetobacter species, and Serratia species being most common. Positive blood cultures for Klebsiella, Citrobacter, and non-aeruginosa strains of Pseudomonas suggest a contaminated infusate. Fungi now account for 20% of central venous catheter infections, Candida albicans predominating. Like coagulase-negative staphylococci, С albicans is able to form a glycocalyx that enhances adherence to catheters. Patients receiving high glucose solutions for hyperalimentation are at particularly high risk for this infection. The clinical presentation of intravascular device-related infection is nonspecific, generally involving fever, chills, and malaise. The finding of purulence around the intravascular device is helpful, but this sign is not always present. The absence of an alternative source for bacteremia should always raise the possibility of intravascular device infection. As observed in case 2, the abrupt onset of chills or hypotension during infusion of a solution through a device strongly suggests catheter-associated infection or contamination of the infusate. The rapid resolution of symptoms following removal of the device, plus positive blood cultures for coagulase-negative staphylococci, corynebacteria, or a fungus are other findings that suggest an infected intravascular device. However, the absence of these findings does not exclude the diagnosis. Rapid diagnosis can be achieved by drawing 100 µL blood from the catheter while still in place, subjecting the sample to cytospin, and performing Gram and acridine orange staining. Purulence around the catheter site provides strong evidence, but this sign is absent in many cases. Cytospin Gram or acridine orange staining of catheter sample provides rapid diagnosis. Roll and sonication methods can be used for quantitating bacteria on the catheter tip. Surveillance cultures are not recommended. Blood samples for culture should be drawn simultaneously from the catheter and the peripheral veins. Bacterial growth from the catheter sample that is 5 to 10 times that from the peripheral sample is quantitative for catheter infection. Positive bacterial growth from a catheter more than 2 hours earlier than positive growth in a peripheral sample indicates catheter infection. However, this method is less sensitive than culture of the removed catheter tip. Two methods for testing the catheter are recommended. The roll method (catheter is rolled across the culture plate) is semiquantitative (positive with 15 cfu or more); the vortex or sonication method (releases bacteria into liquid media) is quantitative (positive with 100 cfu or more). The roll method detects bacteria on the outer surface of the catheter; the vortex or sonication method also detects bacteria from the lumen. The sonication method is more sensitive, but more difficult to perform than the roll method is. The use of antibiotic-and silver-impregnated catheters may lead to false negative results with these methods. Cultures of removed catheter tips should be performed only when a catheter-related bloodstream infection is suspected. Routine surveillance culturing of removed catheter tips is not recommended. When an intravascular device infection is suspected, at least two and preferably three blood samples for culture should be drawn: one set from the intravenous catheter and one to two sets from the peripheral veins. A negative blood culture from a sample drawn from the intravenous line is very helpful in excluding the diagnosis of catheter-related bloodstream infection. A positive culture requires clinical interpretation. As in case 2, when catheter removal is not desirable, quantitative blood culturing has been recommended. A finding of colony counts from the catheter sample that are 5 to 10 times those found from the peripheral samples suggests catheter-related infection. A more practical approach takes advantage of the automated colorimetric continuous monitoring of blood cultures now available in most clinical microbiology laboratories. The time required to detect bacteria in the catheter sample is compared to the time required in the peripheral sample. Detection of bacteria in the catheter sample more than 2 hours earlier than in the peripheral sample suggests a catheter-associated infection. In case 7.2, the history of rigors during intravenous infusion combined with the earlier detection of bacteria in the catheter culture than in the peripheral culture provided strong evidence that the infection originated in the intravascular device. Empiric antibiotic therapy should be initiated after appropriate cultures have been obtained. Vancomycin is usually recommended to cover for methicillin-resistant Staphylococcus aureus and for methicillin-resistant coagulase-negative staphylococci. In the severely ill or immunocompromised patient, additional coverage for gram-negative bacilli is recommended with an anti-pseudomonal third- (ceftazidime) or fourth-generation (cefepime) cephalosporin. In the severely ill patient, the catheter should be removed immediately. The catheter should also be removed if fever persists and blood cultures continue to be positive beyond 48 hours, and if the patient is infected with virulent, difficult- to-treat pathogens (S. aureus; gram-negative bacilli, particularly Pseudomonas aeruginosa; and fungi). Polymi-crobial bacteremia suggests heavy contamination of the line and usually warrants catheter removal. Other indications for removal include neutropenia, tunnel or pocket infection, valvular heart disease or endocarditis, septic thrombophlebitis, or the presence of metastatic abscesses. The duration of therapy has not been examined in carefully controlled trials. Therapy is usually continued for 2 weeks in uncomplicated infection. For patients with coagulase-negative staphylococci, treatment for 5 to 7 days is sufficient if the catheter is removed, but treatment should be continued for a minimum of 2 weeks if the catheter is left in place. In complicated infections in which bacteremia continues despite removal of the catheter, treatment must be continued for 4 to 6 weeks. On average, most catheter-associated infections are treated for 3 weeks. Because of the high incidence of relapse, follow-up blood cultures are important if the line was kept in place. The salvage rate for tunnel catheters can be improved by filling the catheter lumen with pharmacologic concentrations of antibiotic — termed "antibiotic lock therapy." For gram-positive infections, vancomycin (25 mg in 5 mL of solution) is usually recommended, and for gram-negative bacilli, gentamicin (5 mg in 5 mL) is the agent of choice. This treatment exposes the bacteria to very high concentrations of antibiotic that are more likely to penetrate the biofilm. Antibiotic lock therapy is particularly helpful in tunnel catheters, because the associated infections usually develop within the catheter lumen. Cure rates from 60% to 80% have been achieved. Because of the ability of S. aureus to attach to and destroy normal heart valves (70% of S. aureus endocarditis cases occur on previously normal heart valves), infection with this pathogen poses a unique challenge. The duration of therapy after prompt catheter removal is best guided by TEE. The presence of valvular vegetations on TEE warrants 4 weeks of therapy; the absence of vegetations by this test allows treatment to end after 2 weeks without significant risk of relapse. Short-course therapy should be considered only in patients who prompdy defer-vesce on antibiotic therapy and who do not have valvular heart disease or an extravascular focus of infection. In patients infected with Candida species, the intravenous catheter must be removed. Because of the high risk of Candida endophthalmitis (10% to 15%), catheter removal must be accompanied by antifungal therapy in untreated patients. In uncomplicated С albicans infection, fluconazole (400 mg daily for more than 14 days) is as effective as amphotericin В and is accompanied by minimal toxicity. Therapy with systemic amphotericin В (0.3 to 1 mg/kg daily) is warranted in the presence of fungemia resulting from other, more resistant strains such as C. krusei, prolonged positive blood cultures, severe systemic complaints, or neutropenia. the patient is severely ill.
fever and positive blood cultures persist for more than 48 hours. a virulent organism is the infecting agent. tunnel infection, neutropenia, endocarditis, metastatic infection, or septic thrombophlebitis is present. Empiric therapy is vancomycin and an anti-pseudomonal third- or fourth-generation ceph-alosporin. Duration of therapy has not been studied. Average duration is 3 weeks. For coagulase-negative staphylococci, continue treatment for 7 to 10 days if the line has been removed, and 2 weeks if line has been kept in place. For complicated infections, continue treatment for 4 to 6 weeks. Antibiotic lock therapy improves cure rate for tunneled catheters (vancomycin, gentamicin). Infection with S. aureus has a high risk for endocarditis;transesophageal echocardiography helpful in determining the duration of therapy. For Candida albicans infection, always remove the line, and treat for 2 weeks to prevent endophthalmitis. Fluconazole for uncomplicated catheter-related infection. Amphotericin В for severely ill, neutropenic, or resistant fungus- infected patients.